An early title-decider in Bundesliga by the two dominant teams so far. Tuchel has his first game with Dortmund against his supposed-mentor Pep in what was sure to be a great tactical battle. The promise was kept as we saw numerous tactical changes by both dugouts throughout the match. Although Pep led out a team in somewhat of a 3-3-3-1 formation, one could not be criticised for expecting a more regular 4-2-3-1. Instead, Lahm featured as a second 6 whilst the defensive line consisted of David Alaba, Javi Martinez and the excellent Jerome Boateng. Immediately ahead of them sat Xabi Alonso in a trio with Thiago and Lahm. 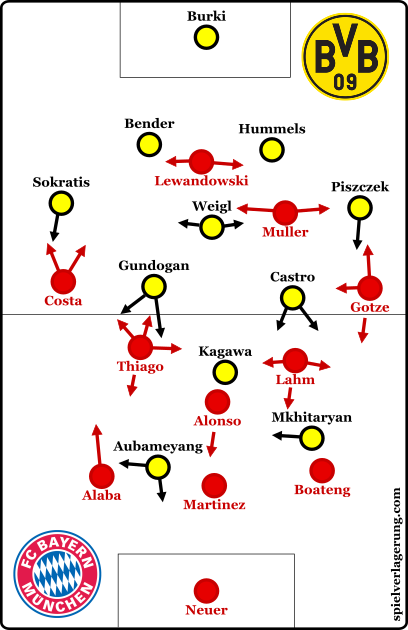 Mario Gotze and Douglas Costa took to either flank with Muller in a flexible role slightly higher behind the in-form Lewandowski. Alternatively we could’ve just as easily imagined a 4-3-3 with Gotze central, leaving a 3-man attack of Costa, Muller and Lewandowski. With the likes of Lahm and Alaba in the side, it is the versatility that they offer which allows Guardiola to have such flexibility in his starting line-up and then for changes during game. This formed a key feature of the game as Bayern moved to a 4-man defensive line following half-time. The system Guardiola worked to some extent, despite some issues amongst the centre-backs. With Lahm and Thiago acting roughly in their respective half-spaces as well as the more free movements of Muller, Bayern were well equipped to play effectively through the wing-orientation. This has been a common feature of their season so far, with many attacks moving through the flanks. Although it is difficult to criticise them based on their results record so far into the 2014/2015 season, it is clear that they are much more effective through the centre and the half-spaces. From these spaces, they can not only form more chances, but the chances which they do create are more dangerous in xG values. Both in Guardiola’s Barcelona and now the positional play being practiced at Dortmund, the focus is much more on the central columns and wider areas are only used for isolations and cut-backs. Pep started his 3-man defence with Javi Martinez in between David Alaba and Jerome Boateng. However, the Spaniard’s passing and vision was insufficient as he missed a couple of opportunities to penetrate the Dortmund block. With Jerome Boateng, Bayern have the best centre-back in the world when it comes to passing with his vertical ‘laser-passing’ one of his key strengths in particular. Therefore after around 10 minutes, Guardiola decided to switch the two and from then until half-time, Boateng was the central centre-back and Martinez right. The German World-Cup winner then became more oriented on playmaking and proceeded to make excellent long balls throughout the game with an especially impressive accuracy. In the first 46 minutes Boateng played 8 long balls – only 1 of which was inaccurate whilst 2 were direct assists as well as one being another chance created. An interesting note upon kick-off was the change from the 4-2-3-1 which Dortmund have used throughout their great campaign so far. The only deviation away from this system has been in-game changes, such as in their first match against Odd BK or when Tuchel has looked to experiment in other Europa League matches. It was therefore, quite a surprise to see them line up in a narrow 4-3-1-2 formation – one similar to that of Hoffenheim’s when they challenged Bayern well earlier in the season. This was especially so considering that, like Bayern, they easily had the personnel to fit their 4-2-3-1 formation with Castro moving to the right-wing in place of the benched Marco Reus, then all positions would’ve been covered as normal. This 4-3-1-2 formation featured Shinji Kagawa playing in his usual position with perhaps the most surprising aspect being the use of Mkhitaryan in the forwards’ line alongside Aubameyang. With these two in a central position, Dortmund looked to break through with quick combinations which were usually played in transitions at Bayern dominated ball possession. Against one of the best teams in possession in the world, it was Dortmund’s defensive strategy which changed more through this new shape. Without possession, Kagawa would often push up to form a tightly-knit 4-3-3 shape alongside the two strikers. Amongst them, they would look to block passes into the centre and half-spaces during the Bayern build-up stage. This was similar to the strategy of Hoffenheim, although it probably lacked the same level of intensity and man-orientation in their marking scheme. Through blocking these key passes, Dortmund aimed to direct Bayern’s build-up to wide areas at which the ball-near striker would shift wider and the ball-near 8 would push up in the half-space. In this shape, they could theoretically then press effectively on a diagonal axis to further restrict Bayern’s central access. In other moments, the front ‘3’ would become slightly less aggressive and instead be more focused on supporting the midfield in central control. Against most teams, this will often force a more tame ball circulation however Guardiola’s Bayern had other issues. Overall, the defensive organisation of Dortmund was not executed to great effectiveness. The integration of Lahm and Thiago in possession helped Bayern, as they could support the structure during these wide moments and make sure that Bayern were difficult to isolate in these weak areas. The pressing also weakened later on in the game, notably following 3-1 as fitness issues could potentially have been a strong factor. Their level of compactness declined and with this, the press became less connected throughout the block and spaces opened up for players like Muller to take advantage. A prime example was the build-up to the 4th goal, before an excellent deep cross by Gotze to Lewandowski who scored his 2nd goal of the game and 9th in the last 3 Bundesliga matches. An impressive connecting-movement from Muller allows a clean wide progression. As the game wore on, Dortmund’s press weakened and the co-ordination lessened. Bayern began to pass more easily through the block and exploit the growing spaces in front of the defensive line. Another feature which Tuchel’s side struggled to cope with was the long balls from the Bayern centre-backs, particularly with Boateng. This has been a common tactic of Guardiola at Bayern when faced with Dortmund, usually done so to avoid the opponent’s pressing ability. Through doing so, they bypassed the centre where the defensive pressure was focused and looked to find direct access to Muller and Lewandowski behind the midfield. How the formations looked following Aubameyang’s goal. Once Dortmund pulled one back through Aubameyang, Guardiola quickly restructured his team towards a 4-2-3-1 which was a 4-1-4-1 at times. Lahm dropped back into his full-back role from 6, Thiago dropped alongside Alonso whilst Muller also moved slightly deeper. Aside from this featured a small spell as a 4-4-2 before half-time. Muller became more of a striker whilst Gotze and Costa took to the wings. Thiago and Alonso became more of a clear double 6 though the Spaniard still benefited from a range of movements. There was also a reaction at 2-1 by Tuchel as Dortmund looked to return to a shape much more common to them this season. Castro became the right-winger whilst Mkhitaryan dropped into his connection-oriented role in the left half-space. Gundogan formed a double-6 partnership with Weigl whilst Aubameyang became a lone striker. However, there were a few changes from the shape we have come to expect with Tuchel’s Dortmund. Primarily in defence, they opted for more of a clear 4-2-3-1 shape as opposed to the shift into a 4-1-4-1 which has been more common in past games. On the introduction of Reus and Januzaj at 3-1, Dortmund then again shifted to a 4-1-4-1 formation with Mkhitaryan deeper alongside Gundogan, Reus on the left-wing and Januzaj coming in from the right. After a much more equal first half, Bayern proceeded to dominate the second for the resulting score-line. They emphasised their superiority past the stage of 3-1 and Dortmund could do little in response.